Bernard J. Carr is a professor of mathematics and astronomy at Queen Mary University of London (QMUL). He studied at Cal Tech as Hawking’s student assistant. Through this section of the comparison, the bbt uses terms defined by Ka, kilo-annus (103 years); Ma, Mega-annus (106 years); and Ga, Giga-annus (109 years). The QE continues to use seconds. Wikipedia says about the so-called Dark Ages, “The time between recombination and the formation of the first stars. During this time, the only radiation emitted was the hydrogen line.”Wikipedia says about the Stelliferous Era, “The time between the first formation of Population III stars until the cessation of star formation, leaving all stars in the form of degenerate remnants. According to traditional big bang cosmology, the electroweak epoch began 10−36 second after the Big Bang, when the temperature of the universe was low enough (1028 K) to separate the strong force from the electroweak force (the name for the unified forces of electromagnetism and the weak interaction). In inflationary cosmology, the electroweak epoch began when the inflationary epoch ended, at roughly 10−32 second. Cosmic inflation was an era of accelerating expansion produced by a hypothesized field called the inflaton, which would have properties similar to the Higgs field and dark energy. While decelerating expansion would magnify deviations from homogeneity, making the universe more chaotic, accelerating expansion would make the universe more homogeneous. 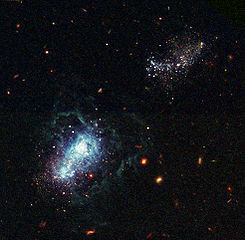 A sufficiently long period of inflationary expansion in the past could explain the high degree of homogeneity that is observed in the universe today at large scales, even if the state of the universe before inflation was highly disordered.Inflation ended when the inflaton field decayed into ordinary particles in a process called “reheating”, at which point ordinary Big Bang expansion began. The time of reheating is usually quoted as a time “after the Big Bang”. This refers to the time that would have passed in traditional (non-inflationary) cosmology between the Big Bang singularity and the universe dropping to the same temperature that was produced by reheating, even though, in inflationary cosmology, the traditional Big Bang did not occur.According to the simplest inflationary models, inflation ended at a temperature corresponding to roughly 10−32 second after the Big Bang. As explained above, this does not imply that the inflationary era lasted less than 10−32 second. In fact, in order to explain the observed homogeneity of the universe, the duration must be longer than 10−32 second. In inflationary cosmology, the earliest meaningful time “after the Big Bang” is the time of the end of inflation . On March 17, 2014, astrophysicists of the BICEP2 collaboration announced the detection of inflationary gravitational waves in the B-modepower spectrum which was interpreted as clear experimental evidence for the theory of inflation. However, on June 19, 2014, lowered confidence in confirming the cosmic inflation findings was reported  and finally, on February 2, 2015, a joint analysis of data from BICEP2/Keck and Planck satellite concluded that the statistical “significance [of the data] is too low to be interpreted as a detection of primordial B-modes” and can be attributed mainly to polarized dust in the Milky Way. The quark–gluon plasma that composes the universe cools until hadrons, including baryons such as protons and neutrons, can form. At approximately 1 second after the Big Bang neutrinosdecouple and begin traveling freely through space. 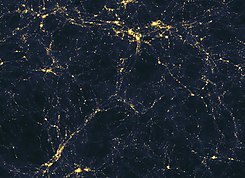 This cosmic neutrino background, while unlikely to ever be observed in detail since the neutrino energies are very low, is analogous to the cosmic microwave background that was emitted much later. (See above regarding the quark–gluon plasma, under the String Theory epoch.) However, there is strong indirect evidence that the cosmic neutrino background exists, both from Big Bang nucleosynthesis predictions of the helium abundance, and from anisotropies in the cosmic microwave background. During the photon epoch the temperature of the universe falls to the point where atomic nuclei can begin to form. Protons (hydrogen ions) and neutrons begin to combine into atomic nuclei in the process of nuclear fusion. Free neutrons combine with protons to form deuterium. Deuterium rapidly fuses into helium-4. Nucleosynthesis only lasts for about seventeen minutes, since the temperature and density of the universe has fallen to the point where nuclear fusion cannot continue. By this time, all neutrons have been incorporated into helium nuclei. This leaves about three times more hydrogen than helium-4 (by mass) and only trace quantities of other light nuclei. At this time, the densities of non-relativistic matter (atomic nuclei) and relativistic radiation (photons) are equal. The Jeans length, which determines the smallest structures that can form (due to competition between gravitational attraction and pressure effects), begins to fall and perturbations, instead of being wiped out by free-streaming radiation, can begin to grow in amplitude.According to ΛCDM, at this stage, cold dark matter dominates, paving the way for gravitational collapse to amplify the tiny inhomogeneities left by cosmic inflation, making dense regions denser and rarefied regions more rarefied. However, because present theories as to the nature of dark matter are inconclusive, there is as yet no consensus as to its origin at earlier times, as currently exist for baryonic matter. Hydrogen and helium atoms begin to form as the density of the universe falls. This is thought to have occurred about 377,000 years after the Big Bang. Hydrogen and helium are at the beginning ionized, i.e., no electrons are bound to the nuclei, which (containing positively charged protons) are therefore electrically charged (+1 and +2 respectively). As the universe cools down, the electrons get captured by the ions, forming electrically neutral atoms. This process is relatively fast (and faster for the helium than for the hydrogen), and is known as recombination. At the end of recombination, most of the protons in the universe are bound up in neutral atoms. Therefore, the photons’ mean free path becomes effectively infinite and the photons can now travel freely (see Thomson scattering): the universe has become transparent. This cosmic event is usually referred to as decoupling.The photons present at the time of decoupling are the same photons that we see in the cosmic microwave background (CMB) radiation, after being greatly cooled by the expansion of the universe. Around the same time, existing pressure waves within the electron-baryon plasma — known as baryon acoustic oscillations — became embedded in the distribution of matter as it condensed, giving rise to a very slight preference in distribution of large scale objects. Therefore, the cosmic microwave background is a picture of the universe at the end of this epoch including the tiny fluctuations generated during inflation (see diagram), and the spread of objects such as galaxies in the universe is an indication of the scale and size of the universe as it developed over time. Before decoupling occurred, most of the photons in the universe were interacting with electrons and protons in the photon–baryon fluid. The universe was opaque or “foggy” as a result. There was light but not light we can now observe through telescopes. The baryonic matter in the universe consisted of ionized plasma, and it only became neutral when it gained free electrons during “recombination”, thereby releasing the photons creating the CMB. When the photons were released (or decoupled) the universe became transparent. At this point the only radiation emitted was the 21 cm spin line of neutral hydrogen. There is currently an observational effort underway to detect this faint radiation, as it is in principle an even more powerful tool than the cosmic microwave background for studying the early universe. 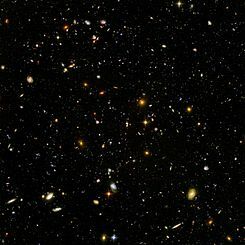 The Dark Ages are currently thought to have lasted between 150 million to 800 million years after the Big Bang. The October 2010 discovery of UDFy-38135539, the first observed galaxy to have existed during the following reionization epoch, gives us a window into these times. The galaxy earliest in this period observed and thus also the most distant galaxy ever observed is currently on the record of Leiden University’s Richard J. Bouwens and Garth D. Illingsworth from UC Observatories/Lick Observatory. They found the galaxy UDFj-39546284 to be at a time some 480 million years after the Big Bang or about halfway through the Cosmic Dark Ages at a distance of about 13.2 billion light-years. More recently, the UDFy-38135539, EGSY8p7 and GN-z11 galaxies were found to be around 380-550 million years after the Big Bang and at a distance of around 13.4 billion light-years. The “Dark Ages” span a period during which the temperature of cosmic background radiation cooled from some 4000 K down to about 60 K. The background temperature was between 373 K and 273 K, allowing the possibility of liquid water, during a period of about 7 million years, from about 10 to 17 million after the Big Bang (redshift 137–100). Loeb (2014) speculated that primitive life might in principle have appeared during this window, which he called “the Habitable Epoch of the Early Universe” . Evolution of the Sun’s luminosity, radius and effective temperature compared to the present Sun. During this time, the energy density of matter dominates both radiation density and dark energy, resulting in a decelerated metric expansion of space. Dark Ages 380 ka–150 Ma 1100–20 4000 K–60 K The time between recombination and the formation of the first stars. During this time, the only radiation emitted was the hydrogen line. Reionization 150 Ma–1 Ga 20–6 60 K–19 K The most distant astronomical objects observable with telescopes date to this period; as of 2016, the most remote galaxy observed is GN-z11, at a redshift of 11.09. The earliest “modern” Population III stars are formed in this period. Galaxy formation and evolution 1 Ga–10 Ga 6–0.4 19 K–4 K Galaxies coalesce into “proto-clusters” from about 1 Ga (z=6) and into Galaxy clusters beginning at 3 Gy (z=2.1), and into superclusters from about 5 Gy (z=1.2), see list of galaxy groups and clusters, list of superclusters.